October 19, 2015 October 19, 2015 by Beau H.
Editor’s note: Check out more Online Shopping Picks here. When we last chatted here at the ol’ Style Guide HQ, we were talking, among other things, about great gear to carry you through fall transitions. There’s a lot that can fall under that umbrella, however — from rugged henleys to crisp blazers and tough boots. But today, we’re talking specifically about outerwear. It’s not quite the weather for a super-refined and heavier topcoat as of yet, but it’s presumably colder than situations where you might just wear a simple long-sleeve tee. And we’re looking for styles that can lend some rugged appeal to dressier outfits, as well as a bit o’ casual cool. So, we’re right in the middle. That means everything from field coats to sweater-jackets are on the table. The picks below encapsulate just a few of the many styles you might find yourself wanting to reach for before it gets incredibly cold — best read up and do some shopping now! An in-between jacket that’s highly versatile. $298? For a denim jacket? Wallace & Barnes definitely represents the pricier iteration of J. Crew’s classic styles, but it seems the outerwear from this particular line is always quite well-done. And this denim bomber fuses a terrific silhouette with the unique styling touches of dark denim … on your top half. It’s definitely a splurge, but it can be styled over everything from an olive henley to a nice chambray shirt. And it’ll fade over time as it gets broken in, lending a distinctive touch to a piece you can really call your own. An unexpected take on the bomber jacket from a brand that excels in accessories. Is that price eye-popping? Yes. Is this an aspirational piece you might pin to a Wish List board? Indeed. 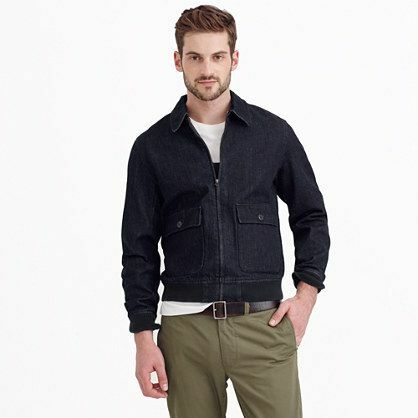 But Shinola is a brand that’s really nailed their identity as far as crafting rugged-refined pieces you didn’t know you were missing until now — like the above bomber jacket. Bringing on the team at Golden Bear is perhaps the best way to make an entry into that category, as well. It’s a big-time luxury piece that updates a military silhouette, like its J. Crew brethren up top. It’d be a great jacket to reach for on those windier days closer to winter — and in the months thereafter. The most versatile thing about it is the fact that it can instantly elevate any outfit, from jeans and wingtip boots to some slim corduroys. Simple style at a super-affordable price. Now that cost above is more like it, right? Old Navy has been quietly upping their style credibility these past few years, and they’ve even outsold their loftier counterparts at Banana Republic and the like (witness their president leaving for Ralph Lauren as proof of this evolution). 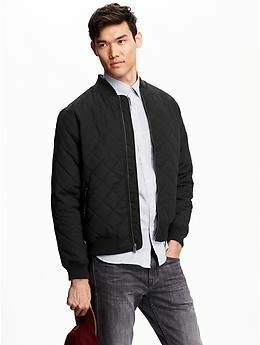 This bomber is a nice example of how they’ve made some waves. It’s not a piece that’ll turn a crazy amount of heads, but it’s affordably priced, versatile and able to handle both rains and fall breezes; the trickiest part about it is that black color, which is less versatile than navy or grey. But if worn casually, it should still fit right in over a henley and some brown chukka boots. Two shades of blue plus some unique details make this a great go-between. Land’s End is another brand that, much like Old Navy, has worked hard as of late to bolster its credibility in the style space. 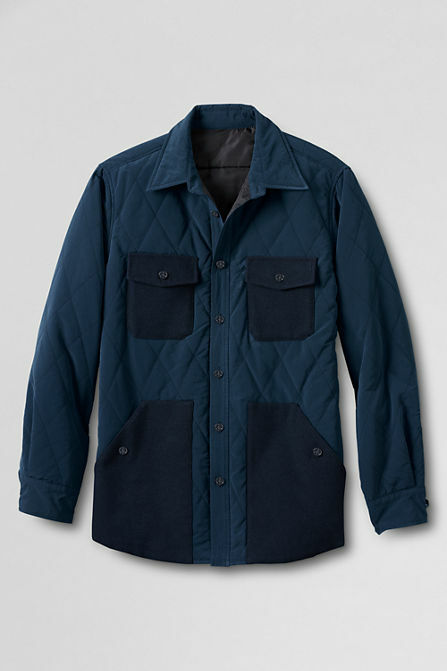 This quilted shirt-jacket is but one of the unexpected ways in which they’re making that effort. It’s a unique piece that’s not quite a full-on jacket, but should still do well layered over everything from a henley (that’s a style suggestion that won’t quit!) to another chambray shirt. Pair this one with some slim chinos for a transitional look and see how it suits you. A moto-inspired style done up in a versatile color. For a brand that’s normally known for its ridiculously affordable suits and trim blazers, Combatant Gentleman has done a nice job expanding into other product categories. And as far as fall style goes, this wool jacket certainly fits the bill. Like the Old Navy piece above, it’s not a style that’s going to turn an incredible amount of heads, but the color is versatile, the fit looks to be trim and it seems to be a nicely functional piece of outerwear. That dark navy color makes it quite sleek, as well. Putting together this list was definitely a tricky ordeal, as so many brands have really looked to their fall outerwear to set themselves apart. J. 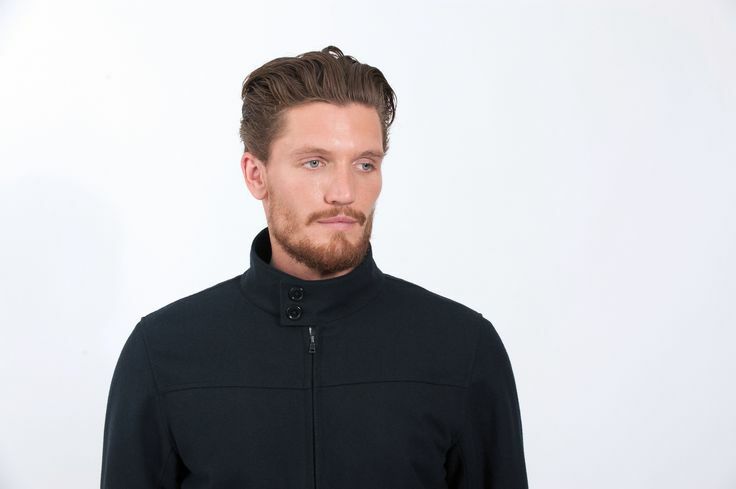 Crew Factory, with its Utility Jacket, has certainly done a nice job filling a budget niche. 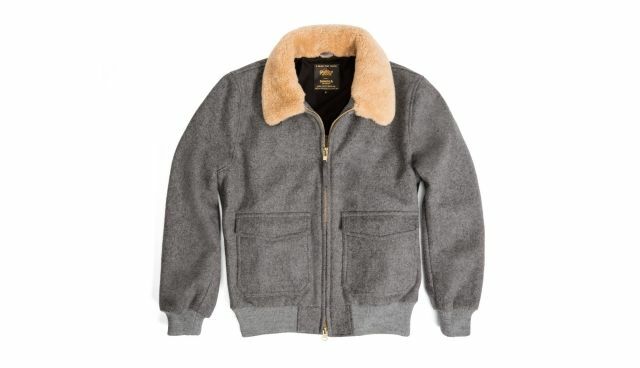 And the entire outerwear collection at Bonobos has some stunning pieces — pricey, but stunning. Be sure to pick up one of these styles now to bridge that gap — and head to this piece on transitional fall style to get a look at how to wear ’em. Stay stylish and thanks, as always, for reading.